Any of you guys used this product called Glutihyde in the place of Glutardehyde? All I could get was Glutihyde instead of Cidex, so I am little confused now. This looks like a 2% solution of Glutaraldehyde. The brand name seems to be covering the actual ingredients name. If the active ingredient is glutaraldehyde then you should be able to use it. You should be able to dose it to your tank. The calculator for dilution is available on the net. The target dilution is 1.5%. This is then added to the tank at the rate of 1 ml for 40 liters. This stuff is very toxic so use Caution and read the instructions before handling it. I think you clarified it clearly and I could see the details too, I will go ahead with it and if anything goes wrong will post here. What happened next in Glutihyde ? Are you got any solution? Because i also got Glutihyde instead of Glutaraldehyde from some source. I not received any PM, please sent return. Now they say it has to be used with a liquid activator. Once activated it is functional for 28 days only. So do you have the liquid activator? How much ml of it is provided? I'm guessing you need to activate it first and then dilute to 1.5% with water. Correct? And to get a final solution of 100ml at 1.5% concentration, we need to add 25ml water to 75ml stock concentration? But then won't the water used for dilution kick off the reaction and neutralise the activated product? Also the precautions section really makes you think whether it is worth all the risk. Thanks Chetan3 for that details, I am sure its gona be helpful to those who are looking for info of the same. 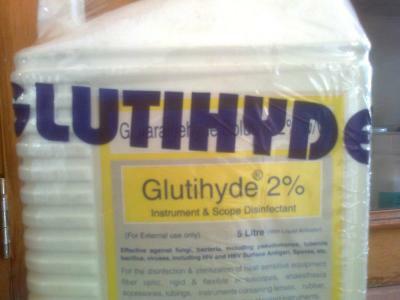 1.glutaraldehyde is used to sterilise medical and dental equipment. 2. So this package is 2% glutaraldehyde with 100 ML of activator. 2.Activating brings out its disinfectant properties in it, which is not useful to our purpose, so I am avoiding activating it and using only the glutaraldehyde part. Thank you very much for this imp information. "Now i am going to start liquid Carbon dosing"